Size: 400 sq.ft. - 1328 sq.ft. 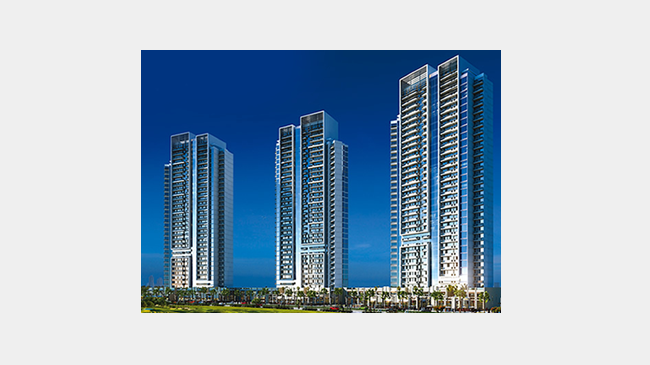 Damac has introduced a new residential project at Damac Hills (Akoya) in 2015. Damac Hills community is spread onto 42 million sq.ft that too with golf community that is viewable from Carson apartments. The formation of Carson Towers is meticulously developed in partnership with Paramount Hotesl & Resorts, Trump, Fendi and Versace. These towers are developed upon elegantly styled lobbies along the breath-taking views. This is the most desirable destination for inhabitants, investors as well as for travellers as a vacationing place. It is containing the selection of different sized apartments The Carson apartments are available at AED 490000 to AED 544000 in the heart of the city. The possession is aiming to be scheduled by Quarter 4 of 2019. Each and every apartment of Damac Carson is furnished with international features with the top most facilities to match the taste of all type of buyers. Each unit comes with one parking space. All three towers are designed to 33 floors (Ground + 3 podium levels + 30 floors for residential apartments). Carson Towers are available with Studio, 1 BR and 2 BR apartments. The apartments have double gazed windows in all rooms with ceramic tiled floors, its classy look is dazzled with a painted plaster walls. The residents of Damac Carson will encounter a life that truly gifts you incredible living destination with open air provisions. DAMAC Properties was incorporated in 2002 and known as a luxury real estate developer. It is part of DAMAC Group which was formed in 1992. DAMAC Properties has established best & iconic mixed use communities in Middle East such as Akoya Oxygen & Damac Hills. They have good number of commercial, leisure, residential developments in Oman, Qatar, Saudi Arabia, UAE, United Kingdom, Lebanon & Jordan. Damac's popular projects are Aykon London One in U.K, The Courtyard, The Heights and The Lofts in Jordan, DAMAC Tower by Lebanon, Damac Exclusive, Damac Tower by Paramount Residences Riyadh and Al Jawarah in Saudi Arabia, Burj Damac Marina, Waterfront, Seaviews and the Piazza in Qatar and some hospitality projects in UAE. About 20000 units have been delivered by Damac and more 44000 homes are under construction stage. This on-going development is placed in one of the supreme location of Middle East. Damac Carson Towers is a proposed residential project at the North West of Damac Hills Development. The key allurement of this community is 4.5 million sq.ft of landscape which is dedicated for open parkland. Damac Hills is a gated community inspired by a quintessential Beverly Hills. Carson buildings have direct access to Akoya Drive that is loaded with Outdoor ice skating rink, Shops, Restaurants, a Putting green, Outdoor cinema etc. Carson Akoya has landscaped surroundings merged with finest elements of quality and class that represent the perfect example of rare living experience. Damac Carson Towers are located at Umm Suqeim Road in Dubailand, Akoya / Damac Hills, Dubai, UAE. At Carson you will find astonishing options of indoor & outdoor amenities as follows - Elevators to all towers, Lobby with a concierge desk, Security access control in Common areas, The Catwalk, Private Healthcare Centre, Medical Centre, Landscape gardens, Centrally Air conditioned apartments, Satellite TV & Telephone connection points, Unisex Gymnasium, Swimming pool, Steam and Sauna, Festive Arena – a seasonal multipurpose area, Recreational Centre, Kids Play Area consists of bouncy castles, swings, slides. Schools: - Little Champions Nursery, Jumeira Baccalaureate School, Gems Wellington Primary, AI raya girls school. Hospitals: - The Dubai Mall Medical Centre, Aquacare Medical Centre , Chinese Medical Herbs Centre. Theatres: - Karnarya Cinemas Pvt Ltd & SEGA Republic. Bank/ATMs: - RAK Bank, Union Coop AI WasI, Emirates NBD ATM. Restaurants: - 800 Pizza, Baker & Spice, Atmosphere, AI Hallab Restaurant, Mezza House.